Cirque has tackled many unique and challenging designs over the years. On this page we feature several custom products, showing some of the solutions possible with our capacitive touch technology. To bring their extensive collection of PC game titles to the living room, Valve needed an interface that was highly customizable and flexible. With a trackpad, users can configure it to track thumb input for movement and targeting, or as a d-pad or button zone input. HAPTIC™ Reactors from Alps Electric provide a tactile feedback. The same design has been leveraged by Valve's SteamVR platform. Development kits compatible with SteamVR can be purchased from Cirque. At Cirque, we have developed various methods for supporting curved sensors. Our engineers wanted to push these techniques to the extreme by tackling one of the most challenging implementations - a touch sensitive ball. Curving the touch sensing electrodes in multiple axises is problematic, as is routing the signals to the touch IC in a practical way. By dividing up the sensor into two hemispheres and utilizing our proprietary "trilobite-style" sensor design we were able to make this concept a reality. Applications include any spherical user input device, or an IoT smart ball for providing data on how user grip and hand position can affect throws. When a medical device company needed a custom interface that could be wiped down and sterilized, they came to Cirque. We developed a configurable control panel, where different parts of the sensor could be designated as trackpads, buttons or sliders in software. The same hardware could then be used with different devices depending on what configuration and top overlay was used. GlideTV had a unique concept for a remote control that rests in a users palm, and can be controlled with a thumb. Combined with an innovative on-screen interface, GlideTV enabled rapid and comfortable interaction for the emerging smart TV and DVR market. 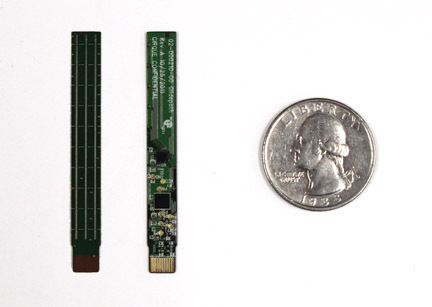 When Cirque was approached by a major semiconductor company looking to add a new dimension of input to the sides of smartphones, we got to work on making a tiny touch sensor that still offered big features. The result is a small strip that can be used for sliding up and down input such as a volume or screen brightness control, and supports cross-sensor swipe gestures for switching tracks, going back and forward in a web browser, etc. without requiring a user to cover up what they are viewing on the screen. Multifinger tracking in the long axis was also supported. The small size of the sensor made the use of packaged ICs impossible, so a die-on-board method was used to place a Rushmore die directly on the back of the sensing surface.